3D gaming has the potential to be an evolutionary step forward for video games. Past attempts at 3D were clunky and uncomfortable, and often times required dedicated hardware that had gimmick written all over them (though we were impressed by the iZ3D line of monitors). So we weren't truly sold on the concept of 3D gaming until we got a chance to test out Nvidia's new $199 3D Vision Goggles. The wireless glasses delivered the best 3D gaming experience we've ever seen. Full impressions after the jump. What really impressed us was the easy setup and the fact that they work with a large number of games. We can't make a final judgment until we put the unit through an extensive round of testing but our first impression is this: We want it. Now. To be honest, the 3D Vision Goggles aren't exactly revolutionary. It isn't as if they contain some secret alien technology that no one's seen before. Basically, the unit consists of a pair of special glasses with lenses that are capable of shuttering open and closed rapidly; the wireless IR base plugs into a USB port and sends the proper signals, telling the lenses when to flicker on and off. Pair this with a compatible display--you need an LCD or CRT monitor (and a compatible video card if you're running it on a PC), or HDTV capable of delivering 3D visuals--and Nvidia's custom software and you're off and running. There are no patches to download, no hacking of .ini files or special tweaks needed; just turn everything on, boot up your game of choice and prepare to be impressed. Some games work better than others and there's a handy compatibility chart that lets you see how well your favorite games fare. We booted up Far Cry, for example, and saw that the game was rated as having "Excellent" compatibility. That's no exaggeration--even from our brief playthrough, we were impressed by what we saw. There was true depth of field and the 3D effect paired wonderfully with the lush jungle vistas found in the game. It definitely added a thick layer of awesome-sauce to the gaming experience. Again, the technology isn't new but the thing we were most impressed with was the easy setup. The IR receiver is small and unobtrusive, the wireless glasses were comfortable (though we are a little concerned about how people who wear glasses would feel after an extended gaming session) and the setup was relatively painless--everything's wired using USB cables, which made it a snap. And the proof is in the pudding--the 3D effect is pretty damn impressive. Again, we'll have to reserve judgment until we've tested the goggles out with a wide array of games but we really liked what we saw in our limited testing. What we weren't so enamored with was the fact that you need special hardware in order to get the 3D train out of the station. 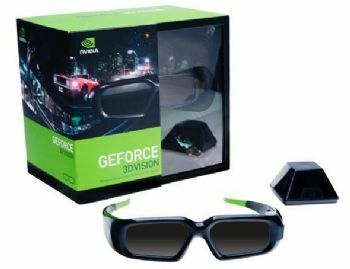 You not only need the 3D Vision Goggles, which retail for $199, but a compatible display or HDTV as well as a compatible video card (ATI owners need not apply, for obvious reasons). The list of compatible displays is rather small--certain Samsung and Viewsonic pure 120Hz LCD desktop monitors, Mitsubish DLP 1080p HDTVs and Lightspeed Design's DepthQ 3D HD Projector--which effectively means that gamers will have to invest in new hardware in order to take advantage of the tech. We understand why, but it's unfortunate considering most gamers already own a badass gaming monitor and HDTV, and probably aren't looking to purchase another. Still, the added "depth" that 3D gaming delivers to the overall gaming experience might be enough to convince gamers to shell out for the full setup. We also expect to see more monitor and television manufacturers add in support in the near future; the fact that an industry heavyweight like Nvidia is behind this also gives us hope that it can gain a foothold and become a legitimate movement rather than a gimmicky footnote in the annals of gaming history. We'll have our full review soon, after we've had a chance to test it out with more games as well as a chance to see how it works with an HDTV and console games, but for now, we're keeping our fingers crossed that this pans out. Now, if you'll excuse us, we have to return to the labs and "test" these goggles some more. It's a tough job but hey, someone's gotta do it. See PC World's CES Topic Center for complete coverage of the Consumer Electronics Show. This story, "Hands on with Nvidia's 3D Vision Goggles" was originally published by GamePro.